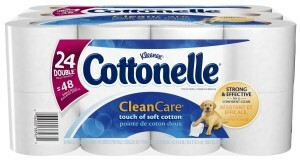 Cottonelle Clean Care Toilet Paper Just $0.19 Per Roll! You are here: Home / Great Deals / Amazon Deals / Cottonelle Clean Care Toilet Paper Just $0.19 Per Roll! Head over to Amazon and get Cottonelle Clean Care Toilet Paper 24 double rolls (Pack of 2) for as only $20.74 after Subscribe and Save and clipping the $2.00 coupon. And, it will ship for FREE! This is equal to $0.22 per single roll – a great deal. Even better, when you subscribe to 5 or more shipments in one month, the price will drop to $18.35 after coupon. This is only $0.19 per regular roll! !